For a rather pedestrian Saturday just over three weeks out from election day, there were actually a handful of meaningful polls released that refined our outlook in a couple of states. The remainder offered results that were out of step with where the FHQ weighted averages now stand. All told there were four new polls from four states and FHQ added a dated survey from South Dakota as well. Why not start with one of those polls that is not consistent with the picture built throughout a year's worth of polling? President Obama has led in exactly one poll in the Grand Canyon state in 2012. That was back in April and also came from Behavior Research -- the last poll the firm conducted there. The count then? Yeah, Obama edge Romney in that one too by the very same 42-40 margin. That is coincidence and that's fine. What isn't is the idea that there are still 13% of Arizonan who have not decided in this race. Outlier. Moving on. Up in the Land of 10,000 Lakes, NMB Research weighs in with its first publicly available survey of the cycle; one that differs somewhat from the survey PPP that partially overlapped with this poll in the field. NMB finds a tighter race than PPP did, and one with the narrowest margin in any poll there all year. The poll shifts Minnesota over the Strong/Lean line into the Lean Obama category, but only barely. As FHQ has mentioned in the past instance(s) when Minnesota has ventured over into Lean Obama territory, this jibes well (or better) with our broader conception of the state's place in the overall ordering of states. It is a little to the left of neighboring Michigan and Wisconsin, but "looks better" in the same category with those states. The truth is that Minnesota has hovered on the Strong/Lean line since the thresholds were lowered at the beginning of October. This is more a cosmetic change than anything else. FHQ won't dwell on South Dakota other than to say that the scant level of polling in the Mount Rushmore state had indicated a closer race there than in some of its neighboring states. That has now been remedied with the addition of a couple of Nielson Brothers surveys with Mitt Romney up double digits. That stretches the average out to over 10 points and brings the state in line with Montana, Nebraska and North Dakota; all states bordering South Dakota. 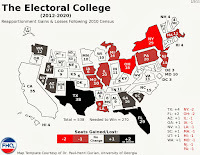 With the changes to Minnesota and South Dakota, the map has a couple of changes but perhaps not where folks would expect; in the underlying electoral vote count. That tally has remained intact since the very first run in this series of posts back in mid-July. 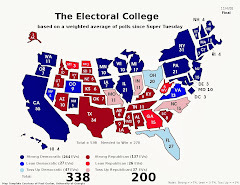 Given those changes on the map, there are some attendant shifts on the Electoral College Spectrum below. South Dakota jumps six positions deeper into the Romney side of the ledger. Again, it is now in line with several neighboring states. Arizona, on the strength of the one outlier poll, drew closer and is now the closest of the Lean Romney states. 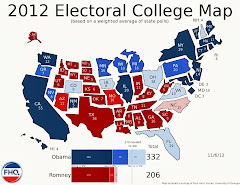 Granted, none of those states is within reach for the president. 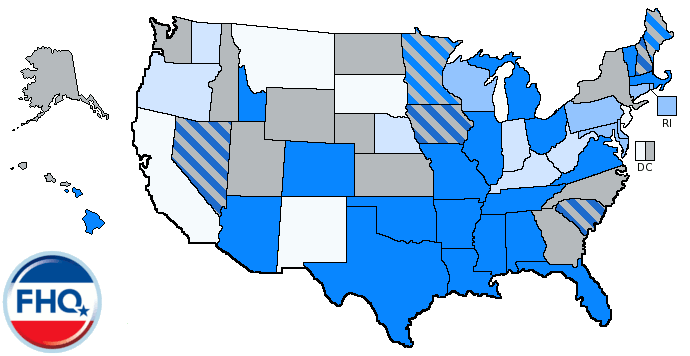 In fact, the three lean states that are left on Romney's side have all been stationed there with little or no movement for quite a while now. The only other state that might have moved was Minnesota. And while it is shaded differently than it was, the Land of 10,000 Lakes holds the line in between New Mexico and Oregon. While Minnesota did not change slots on the Spectrum, it has shifted on the Watch List. Instead of being on the Strong Obama state with the narrowest margin, Minnesota is now the Lean Obama state with the widest margin. It continues to hover on that line. Further south, Florida, Nevada, New Hampshire and Ohio are all closer states that bear watching as the race approaches the three week mark.